Paddy finally retired from the army in 1955, choosing to keep the rank he held. He was allowed to postpone his retirement a few months, so that he would have served exactly 25 years. After returning to County Fermanagh with Una and the boys, Paddy worked hard to establish himself in chicken farming, making chicken houses to his own design. However, it became clear that with foxes and other difficulties, chicken farming was not going to provide sufficient income. So he and Una bought ‘The Hotel’ in Lisbellaw, County Fermanagh, which they renamed ‘The Wild Duck Inn’. While the main business of ‘The Wild Duck Inn’ was the public bar, Una looked after the catering and accommodation for visiting fishermen and the like, while Paddy enjoyed supplying the local gentry with fine wine he obtained from Justerini and Brooks in London. Paddy revived his lifelong interest in horses by starting to breed them. Although he could only afford to do this in a small way, he was nevertheless remarkably successful in that he bred four foals that went on to win races. 'Lucky Argument' won four races in a row including the Andy Capp Handicap Stakes and Lomond Shoe won at least three races. Castle Shane won races in Belgium, and Evening Slipper, also a winner, was potentially the finest. When they sold the inn in late 1971, Paddy and Una went to Derry, Dromara, County Down, where they farmed and bred horses for 12 years. In 1984 Paddy and Una sold up and moved to St Leonards-on-Sea, so that they could be nearer three of their four sons, Peter, Michael and Desmond. This was a whole new adventure in a beautiful house looking straight out to sea. There was a large garden where they continued their passions for gardening, Paddy with vegetables and Una with flowers. Sadly Una died on 16th January 1986. 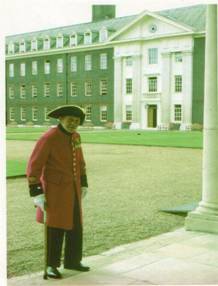 Paddy continued to live at St Leonards until August 1999 when, as a result of declining health, he applied to become an in-pensioner of the Royal Hospital, Chelsea. Although it is not usually open to ex-officers, it was decided that he should be given special dispensation, because he had joined the army as a lowly trooper and worked his way up through the ranks to Major. He settled in well at the Royal Hospital and was very happy there. He was cared for to the highest standards until his death on Saturday 2nd September 2000. Paddy enjoyed life immensely and was never happier than when he was doing things to help people. He commanded a great deal of respect and was scrupulously honest. He also had a very fine dry sense of humour. With tremendous energy, he loved hard work and long walks. One of life's natural inventors, he always had some ingenious solution, no matter what problem was confronted. Reliable, kind, gentle, modest, courteous and polite he was a true gentleman. His sons will always be very proud of him and remember him with great affection.